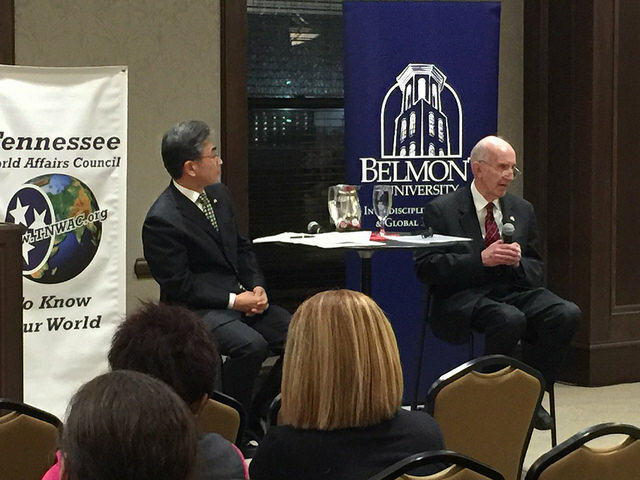 The Tennessee World Affairs Council (TNWAC) hosted a conversation with Japan’s Consul-General Masami Kinefuchi, resident in Nashville, and Dr. James Auer, a distinguished scholar who heads the Nashville-based Auer U.S.-Japan Center, regarding “U.S.-Japan Relations: An Enduring Security Partnership Faces New Challenges.” The Feb. 23 town hall was hosted by Belmont University Interdisciplinary Studies and Global Education, represented by Professor Joan Li, in association with the Japan-America Society of Tennessee (JAST), represented by its director Leigh Wieland. The constraints of Article 9 of the Japanese Constitution are a fundamental determinant of Japan’s defense force’s roles. Kinefuchi said, “The article stipulates our renunciation of war and military force.” He noted that new legislation in the area of peace and security allows Japan to participate in a wider range of UN peacekeeping operations and other international coordinated efforts, provide necessary support when a situation ‘has an important influence upon Japan’s peace and security or threatens international peace and security’ and exercise the right to collective self-defense when specific conditions are met. Auer opened a conversation with Kinefuchi following the briefing where they addressed the questions of collective self defense, the Okinawa basing issue, the origins and changes in the Japanese Constitution, threats from North Korea and concerns about China’s expansion and intentions. The event was organized by TNWAC, a nonpartisan, educational, nonprofit group that works to educate and inspire a greater understanding of global issues among members of the community. In addition to a regular speaker program, TNWAC organizes local discussion groups, student international affairs awareness programs and teacher training. Upcoming programs can be found here. The Japan-America Society of Tennessee is a nonprofit organization that works to create mutual economic benefit through a prosperous relationship between Tennessee and Japan. The annual Nashville Cherry Blossom Festival is one of its many community events that can be found here.